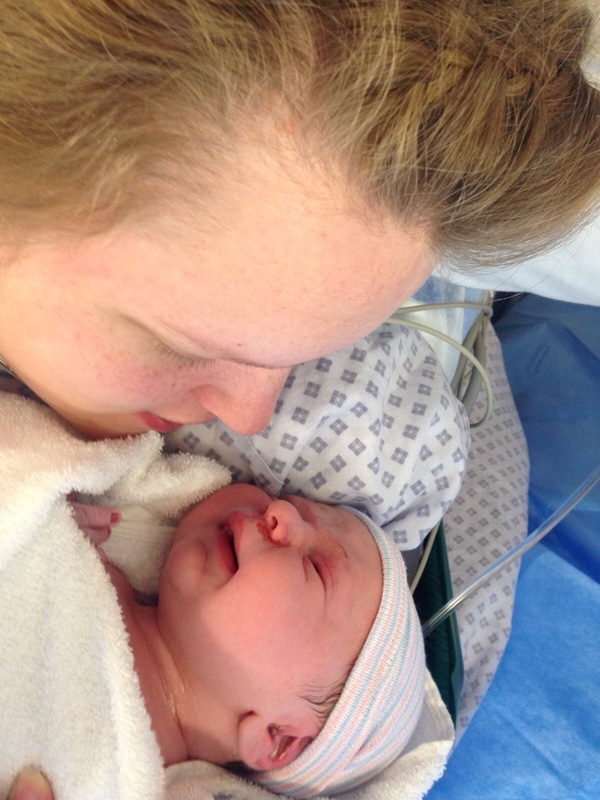 As a first time mum, I thought a LOT about my birth plan. It’s something I heard a lot about when reading baby books and watching movies. I kept waiting and waiting for my midwife to talk to me about my birth plan. There was a section in my maternity notes for it, so I assumed we would write it at one of my maternity appointments. I was so excited to write it! I had an idea in my head about what I wanted and exactly how my birth was going to go. However, there was no mention of the birth plan until my ante-natal class when I was 8 months pregnant. And when it was mentioned, it was basically said that no birth ever goes to plan, so birth plans are pointless. I was so disappointed to hear this. I thought writing a birth plan was going to be a big part of my pregnancy – deciding exactly when and where and how I was going to have my baby (ok, maybe not “when” as he would come when he was ready!) As a PA, I’m a natural planner, everything I do is planned down to the minute! When we went on holiday to New York, I did an (awesome) itinerary, planning every day almost to the minute – my brother in law joked that I hadn’t planned our toilet breaks (we would be having too much fun for that!!). So to not have a birth plan?! No, not an option for me. I needed to have it written down, so I could prepare myself, and also prepare my husband. After our ante-natal class, I sat down with Craig and we went through exactly what I wanted and what I didn’t want. I wanted to have the baby at my local midwife-led birthing unit. There were no doctors here, just midwives, and I felt that this would allow me to have my natural, relaxing birth with no intervention. I’d met a lot of the midwives at my maternity appointments and ante-natal classes, and they were all so lovely, so I was really looking forward to having my baby there. I was absolutely desperate for a water birth. I wanted to get in that pool, relax and birth my baby in my own time, using water as a natural pain relief. I’d read so much about how calming a water birth was, and had spoken to many people who had experienced one and said how they thought it had meant their labours were quicker, calmer and less painful. I didn’t want to be induced. I knew that I was within my rights to refuse induction, and although it would mean that I’d probably have to attend hospital for daily monitoring, I wanted as few interventions as I could. I was adamant I didn’t want an epidural – I’d done my research, and I didn’t want to be tied to the bed, not able to move around, and I’d also read the drug could make baby sleepy, and impact on breastfeeding afterwards. It just wasn’t something I wanted, so I felt I needed to have this written down so when I was in so much pain and screaming for drugs, my husband and midwife knew what it was I really wanted and stuck to it. I really wasn’t keen on having gas and air, I thought it would make me feel sick, so I wanted to try for as long as possible without it and see how I got on. I was also really keen to have delayed clamping of the cord. I had heard a little about it, but didn’t really understand it and the benefits until I went to my ante-natal class. For those who haven’t heard of this, it is where you delay cutting the umbilical cord until all the blood has gone from the placenta to the baby. Sometimes this is done after the placenta has been delivered. This can take only a couple of minutes, but the baby will get up to 30% more blood by doing this. The benefits of this are huge, so it’s definitely something worth researching. I wanted skin-to-skin contact straight away, and we wanted to experience what is known as “the golden hour” as a family, where we were left alone, just me, my husband and our baby, to bond and get to know each other straight away. So my birth plan wasn’t very in depth, or long, or demanding! Just a few simple things we wanted. However, as you will know from reading my birth story, even the best laid plans can go amiss. I had planned for everything, I knew everything I wanted and what I didn’t want, but unfortunately in labour you can’t always have what you want. I had to be induced. Because I had suspected pre-eclampsia, I had to be admitted to hospital straight away and the decision was made for me to be induced as I was already 8 days overdue. Although I had initially decided to refuse induction, because of the health implications, I felt I couldn’t do this and had to do what was safest for me and my baby. I wasn’t given any other options by the hospital, and because I was a worried first time mum, I did as I was told. I didn’t get to have my baby at the midwife led birthing unit. Because I was being induced, I had to go to the main hospital and wasn’t allowed to be at the midwife led birthing unit. I was so upset when I was told this, and I felt this was the first in a long line of things I wasn’t going to be allowed with my labour (I was right!!). I didn’t get to have a water birth. Again, because of the induction, I wasn’t allowed a water birth because myself and the baby had to be monitored, and I had to have frequent internal examinations to assess my progress. Even now, I’m upset I didn’t get a water birth. I’d been looking forward to it so much (yes, really!) and felt my control over my labour was ever so slowly slipping away. I gave in and had gas and air. Now, to many this won’t seem like a bad thing. I’ll admit now, I LOVED the gas and air! I held out for as long as I could in order for me to have as natural a birth as I could, but after over 30 hours in labour with no pain relief, I couldn’t do it anymore. But, it’s nothing to be ashamed of, and I don’t know why I felt like I’d be a failure for having pain relief – it’s really not a bad thing. I would absolutely have it again if I needed to, but I’m glad I waited as long as I did because I think if I’d had it any earlier, I wouldn’t have coped so well with the stronger contractions once I was on the drip. It did make me feel drunk, and a little out of it, which I don’t like now I think back, as I can’t remember a lot of my labour, but that could also be down to the fact I was so sleep deprived! I didn’t get to have delayed cord clamping. Because I had to have a caesarean, I wasn’t allowed delayed cord clamping. The baby had to be out and cut straight away so they could check him over, and then deliver the placenta. Although disappointed, I could understand this decision completely. I didn’t get to have skin-to-skin straight away or experience the golden hour. Again, I was upset not to have this contact straight away as it was very important to establish breastfeeding, and get that initial bond. Because I was still being stitched up, I couldn’t have him placed on my chest. I was lucky that once he was weighed, cleaned and wrapped up, I was able to hold him though, as I’ve heard of other mums who weren’t allowed to do this. I was also able to hold him as I was wheeled into recovery. We kind of got our golden hour once we were in recovery, as although I was exhausted and still under the influence of gas and air and the spinal block, we had our little moment with our baby boy. The midwife took photos of us, and the recovery nurse helped me to latch Alfie on, and he took his first feed. I don’t think I could appreciate this as much as I should have because of my spaced out state, but the fact he latched straight away, and fed for at least half an hour was brilliant. The only part of my birth plan that I was able to stick to was not having an epidural. Even after almost 3 days of labour, I didn’t have an epidural. Obviously I had to have a spinal block for the caesarean, but I don’t think anyone can refuse pain relief for that!!!! So, on paper, my birth was a disaster! It was long, it was drawn out, it was traumatic, it was different, it didn’t go to plan. Does that matter? At first, I said no, no it didn’t matter at all, all that mattered was my baby got here safely. I was completely at peace with my labour, with everything that went wrong, and all the things I didn’t get. Now? Now, I’m conflicted again. I know deep down I had to have the emergency caesarean for the health of me and my child. But I still can’t help but feel…sad that I didn’t get the birth I wanted. Not disappointed, as I know it wasn’t my fault. Just sad. In hindsight, I wish I’d done more research about induction, about caesareans, about labouring when you can’t move around freely. Would it have mattered? I think so. I think I would have been more prepared and could have altered my birth plan. But, even though this labour didn’t go to plan, it doesn’t mean my next labour won’t. Or the one after that. Or the one after that (ha, only kidding, there won’t be four labours!!) Will I make a birth plan for my next baby? Absolutely. Even though only one thing was followed from my birth plan, I would still do another one every time. Hopefully at least one will go to plan! It’s so sad that most birth plans never really go to plan isn’t it. I am hoping for a few different things this time round.